Concise, mathematically clear, and comprehensive treatment of the subject. Expanded coverage of diagnostics and methods of model fitting. Requires no specialized knowledge beyond a good grasp of matrix algebra and some acquaintance with straight-line regression and simple analysis of variance models. More than 200 problems throughout the book plus outline solutions for the exercises. This revision has been extensively class-tested. For more than two decades, the First Edition of Linear Regression Analysis has been an authoritative resource for one of the most common methods of handling statistical data. There have been many advances in the field over the last twenty years, including the development of more efficient and accurate regression computer programs, new ways of fitting regressions, and new methods of model selection and prediction. 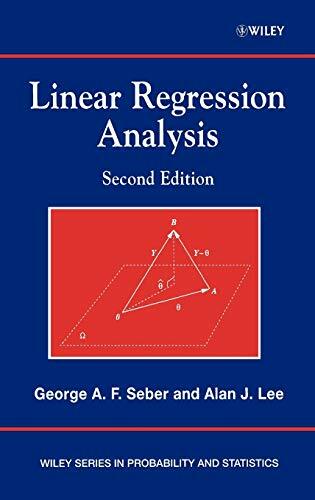 Linear Regression Analysis, Second Edition, revises and expands this standard text, providing extensive coverage of state-of-the-art theory and applications of linear regression analysis. Seber, George A. F.; Lee, Alan J.